For information about my bottle chandelier in Tap Social please go to my bottle chandelier page here. It’s about time I revealed my hoarding of bottles which started with casually finding a bovril bottle and it’s now ballooned out of control so that every shelf, cupboard and surface is covered with bottles. It’s important at this stage to point out that all the bottles have been dug out by badgers, as revealed when the nettles have died back in the winter. I have not been partaking in bottle digging which is unlawful and makes a horrid mess. 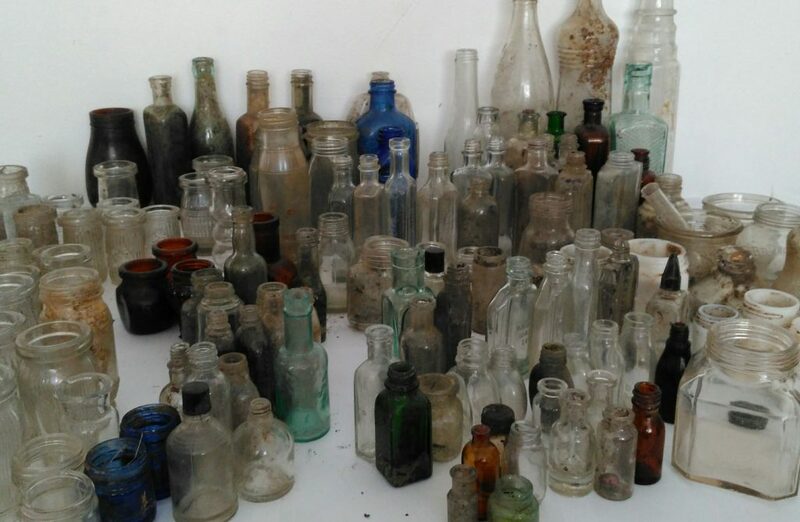 My bottle collection consisting of 1920s-1930s bottles. Some are cleaned and others are straight out of the ground. What shall I do with all these bottles? 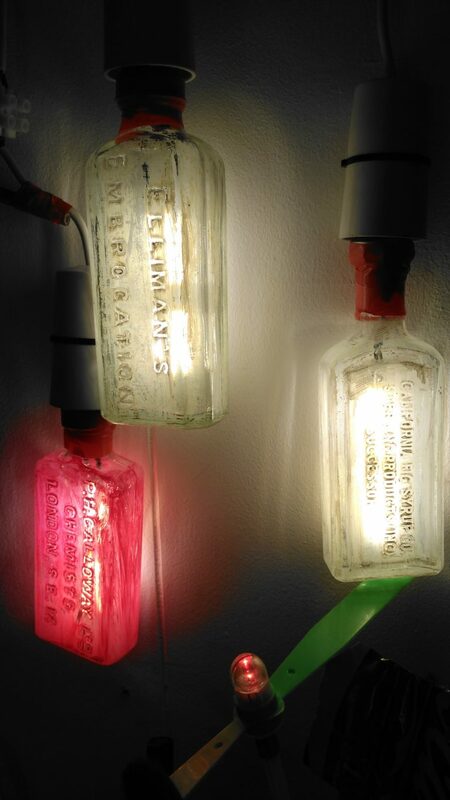 Well they’re not worth much – people are selling 5 for a fiver on ebay- could they be repurposed as lightbulbs? 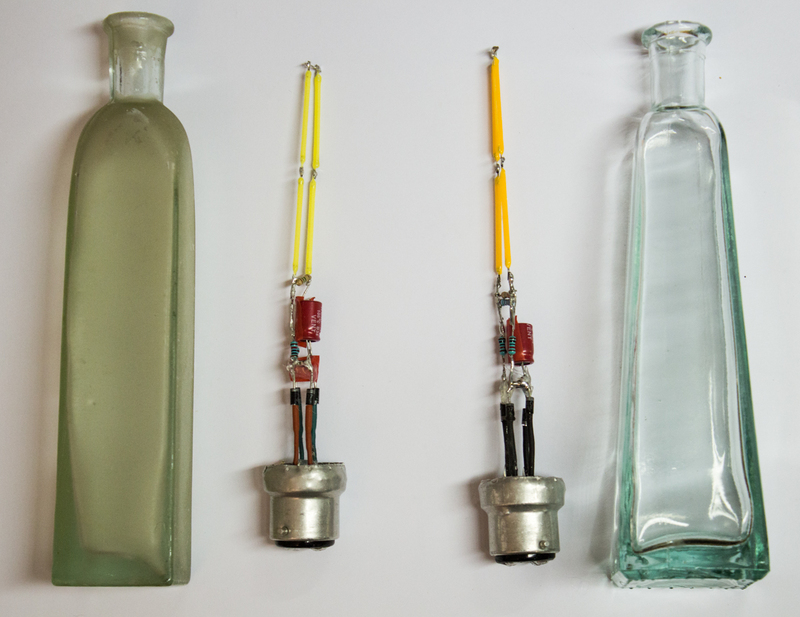 This involves taking the base of a bayonet filament lamp and building the circuitry as part of the support structure of the filament, and in this case placing it in a test tube. I will be substituting the test tube for a 1930s bottle with a neck of similar diameter. The LED filaments are compact, have good heat dissipation and are pretty similar in colour to tungsten filaments. 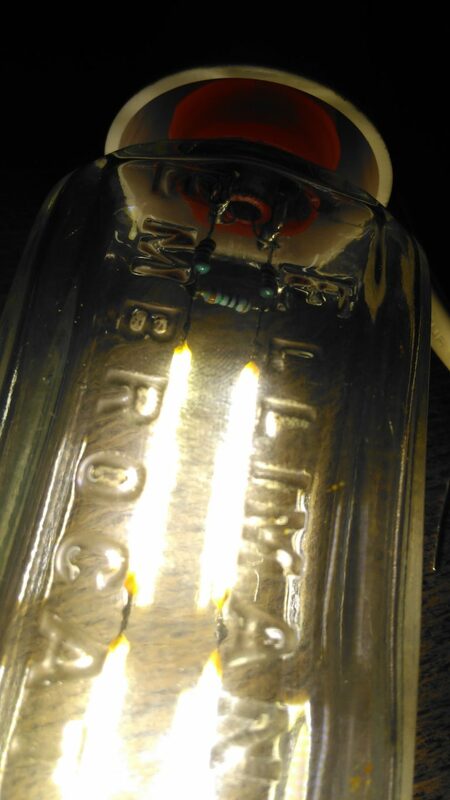 This is the bayonet base of the bulb which is essential for connecting the bottle to 240V mains. The bayonet bulb bases come from compact fluorescent bulbs which a gentleman I started chatting to in Poundland who said that he had a whole boxful of CF bulbs, so I went round to his house and collected them. 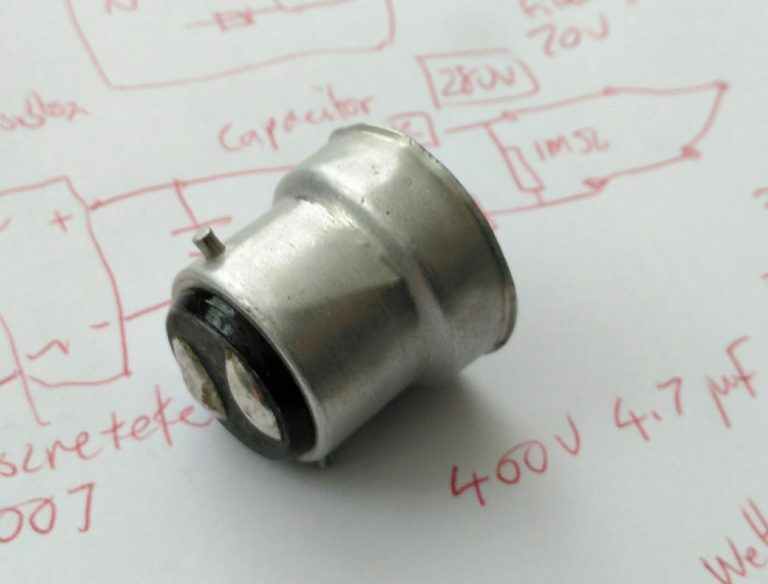 Bulb with diodes, capacitor, resistors which form the support, and regulate the current, and the LED filaments. I painted on some titanium white ink which brings out the text and I’ve made a very crude ‘chandelier’ with some wire joiners, bulb holders and bamboo sticks. 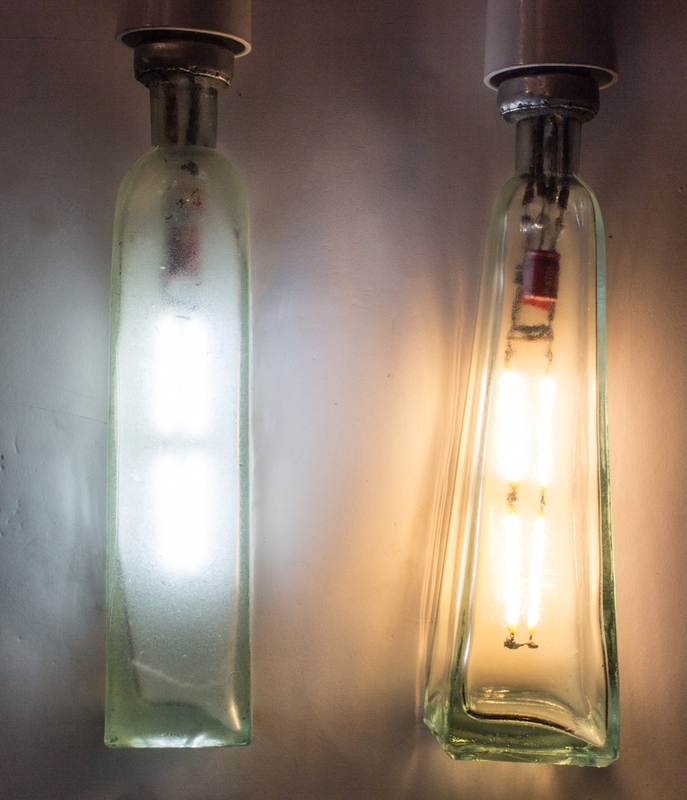 Three bottles repurposed as light bulbs. The completed bulbs – one was warm and the other was cool filament. I have made 15 of these bulbs and they will form part of my bottle chandelier which is on display at OVADA gallery from 6th-23rd April 2017.